It appears the yellow vests are rioting because people donated to rebuilding Notre Dame, and didn't give their money to the yellow vests. I don't think the birtherizing of the arson/terrorism question tells us anything about what happened to Notre Dame. It is just typical left-think. Blaming brown people is worse than any terrorist act a brown man might commit, and they've told us so a hundred times. Every terrorist act is followed immediately with ominous talk about how horrifying it would be if there were any backlash against Brown Man Good. And it would be horrifying. Just, ya know, let's finish burying the victims before we get all down in the mouth about what some racist might do. You could always man purse it. My new purse is very unisex. Honestly, I would consider using that. Especially if it did NOT have that "Komal's passion leather" tag on it. I have a metric adjustable crescent wrench for that. It needs to be left handed. 1 1/16" is probably your best bet, that works out to 1.0625"
My lathe has a bolt that measures 1.044" across the flats. It could be metric. What size wrench should I buy? Pretty obvious. You should buy a 1.044” wrench. But does it have a shoulder thing that goes up? 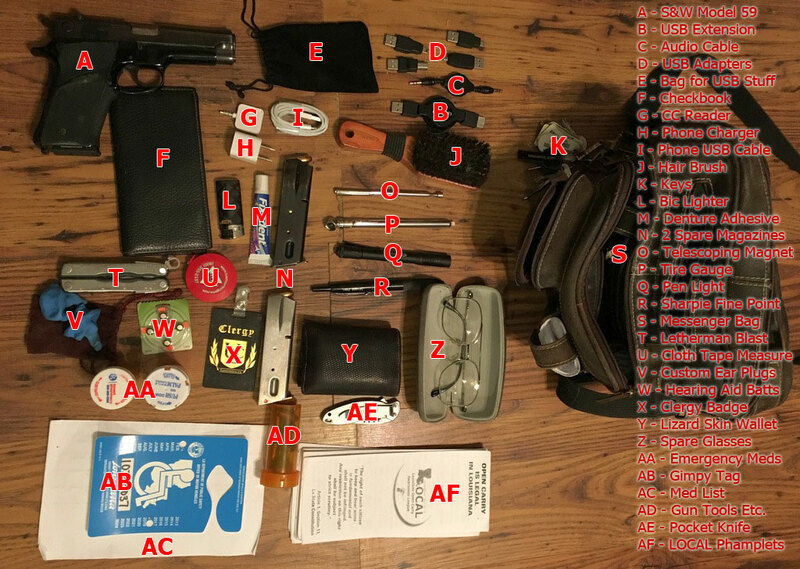 I've since added an changeable bit MAC Tools screwdriver and an 8" Crescent Wrench to the bag, changed to a Glock 19, added a pill bottle full of quarters and a pill bottle full of Dimes, Nickles and Pennies.